When you fly in to Lisbon, you will notice during the landing 2 huge football stadiums, from the 2 rival teams in Lisbon: Benfica and Sporting. 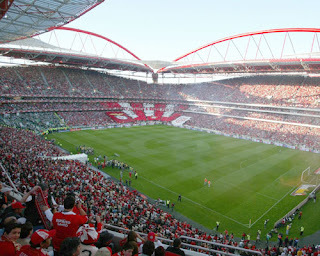 The red stadium is from Sport Lisboa e Benfica (SLB), also called "the cathedral" by their supporters. I can confirm it is a spectacular arena as we already watched a match over there. The Sporting stadium has a green/white/yellow colours from the outside and is therefore, called "casa de banho" by the Benfica fans, as it resembles to the interior of the smallest place of the house.